Brr it's cold in Belgium. I write this as I sit on my bed under two blankets, wearing 4 layers and a toque, all while drinking warm tea. What happened to the 20 degree weather from yesterday? At least the rain has gone away. Rest days between races are so nice. They give you a chance to relax and recover both mentally and physically from the demands of racing. When there's only a few days in between races, the focus is more on recovery and not actual training. Most of the rides are easy and include very few intervals. Some cyclists really enjoy doing coffee shop rides on rest days! These consist of riding to a coffee shop within close proximity to the house, spending more time hanging out drinking coffee then actually riding, then eventually going home. Coffee shop rides are quite wonderful. 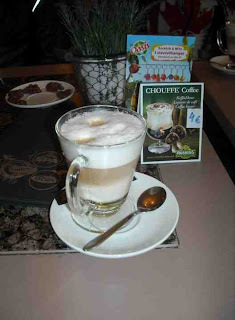 We discovered the greatest coffee shop in a small town near Tielt just last week. First they had a speculoos latte on the menu which I just had to try. Speculoos for those who have never tried it is a sort of like ginger cookies in spread form. It's quite popular in Europe, along with nutella.. Second, the waiter at the cafe kept bringing us plates of home-made chocolates. I think all of us left that cafe quite high on sugar with sore stomachs. Still it was worth it, they were so delicious :). We leave tomorrow to return to the Netherlands. I think everyone is recovered and ready to get back to racing again!